FG Wilson, now owned by Caterpillar, the company which makes the armoured bulldozers that demolish the homes of Palestinians, announces the loss of almost 800 jobs with more to follow. With the multiplier effect of such a large salary bill there’s no doubt many shops in east Antrim will shed workers too before they themselves have to close. The north’s jobless total grows to be the largest of any UK region. The first minister takes immediate action. He proposes a resolution asking the Irish government to apologise for its role in the early days of the Troubles. Talk about distracting attention from the real issues? It’s a classic unionist ploy to produce a divisive topic to deflect criticism from their failure to deal with economic and social matters. The truth is the unionists who represent east Antrim have precisely nothing to offer to explain or replace the loss of such vast financial and economic resources. Ministers told the media they were going to have ‘meetings’. Big deal. No wonder Peter Robinson prefers to talk about events 40-odd years ago rather than admit his party has no economic or industrial policy to deal with the north’s circumstances and that its inward investment policy is a complete failure. Much lip-service paid to having corporation tax reduced but it is quite obvious Sammy Wilson doesn’t agree and everyone knows it was never going to happen because Alex Salmond would demand exactly the same and with greater justification. So instead let’s talk divisive nonsense to unite the party agin the Fenians. Blaming the Irish government for the Troubles is a popular myth among unionists for two reasons. First, it means unionists take no responsibility for creating the conditions which produced the explosion of popular rage among nationalists in 1969. Don’t forget it was unionism which brought the gun back into Irish politics in 1966 when Gusty Spence and his so-called UVF gang killed John Scullion and Peter Ward. It was UVF bombs that blew up the reservoirs in 1969 months before the Provisional IRA emerged out of the ashes of Bombay Street. Secondly, blaming the Irish government also feeds the myth that the IRA originated and was sustained in the Republic whereas it was home-grown in the north and fertilised by the behaviour of the RUC, UDR and British army. Robinson himself used to feed this myth at one stage suggesting a fence around the north like the Israelis built along the border with Lebanon. How many troops would it have taken to guard it? How many booby traps per square metre did he expect? No matter, the proposal was popular with unionists since there were obviously no IRA men in Belfast or Derry or Coalisland. People in those places were just sitting waiting for the hordes of IRA men pouring over the border carrying early versions of sat-navs. The ‘safe-haven’ myth is too ridiculous to credit. Again wilful unionist ignorance prevents them knowing the cost of the Troubles to Irish governments in terms of tourism and security, not to mention prisons like Portlaoise. If the Republic was a safe haven why were there so many IRA men in prison? If Ardoyne and the Bogside weren’t safe havens why didn’t the RUC go in and arrest all the strangers from the Republic? It’s all too daft to take seriously. Finally, while today’s Irish government can’t possibly be held to account for events 40-odd years ago there’s one person at least who could give a personal apology for events he was responsible for. How about Robinson apologising for leading a 500-strong loyalist mob into Clontibret in August 1986 in protest against the democratic decision of his own government? His invasion resulted in two gardai being injured, himself convicted of a criminal offence and fined 17,500 pounds. The judge described him as a “senior extremist politician”. 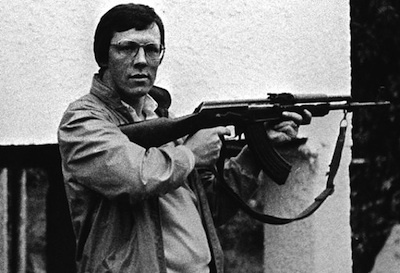 Did Robinson’s irresponsible antics in 1986 do anything to calm people, or did his example encourage any young men to join Ulster Resistance, which Robinson, after prancing around in a comical red beret, dropped like a hot potato as soon as it looked as if some people were taking his speeches about Armageddon seriously. Let’s have an economic proposal.